Saturday, March 20, 2010 - Pikko.info, " Welcome to visit on our info site." diletakkan di meja operasi seperti di rumah sakit. Pengunjung bisa memakan bagian tubuh mana saja. Tubuh yang dipotong akan mengeluarkan darah, persis seperti potongan tubuh manusia. placed on the operating table like in the hospital. Visitors can take any body parts. Body that would cut out the blood, just like pieces of human bodies. Marton Theme Restaurant, in Kaohsiung (Taiwan) to provide toilets for their customers feel. Decorating the room, and dining chairs that are used just like in the toilet. 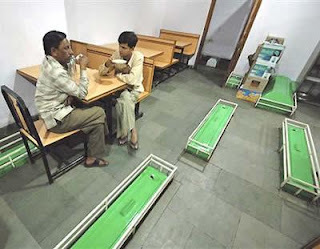 The table is made like a bathtub, and provided food placed on the plate and bowl are designed like a toilet seat. 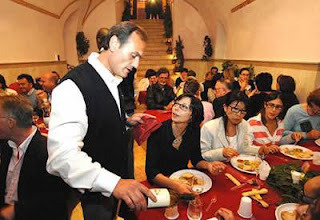 The food served here is not only delicious, but also gives the sensation of his own for the visitors. 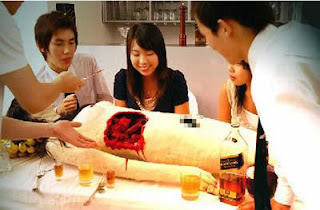 Darkness Restaurant located in Beijing, China. All restaurant design really black. 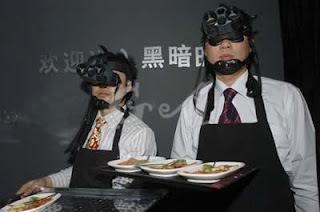 Visitors who came to be in between the waiter who has been equipped with night-vision goggles to the table. Flashlights, cell phones, watches prohibited in this area. Because they can not see the food eaten, visitors really measakan foods that have never eaten before in this restaurant. 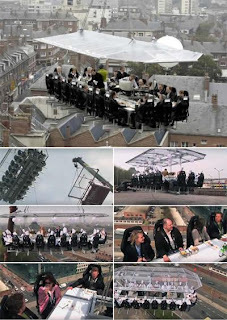 This restaurant is located in the most-tempang most secure, the Fortezza Medicea prison in Italy. This restaurant decor is a prison where the killing is equipped with 60 foot high walls, watchtowers, security kemera which has been operating for 500 years. In addition, this place is also equipped with a prison guard with a complete weapon. Why is called the robot? because the restaurant is open all day for 21 hours without tiring. 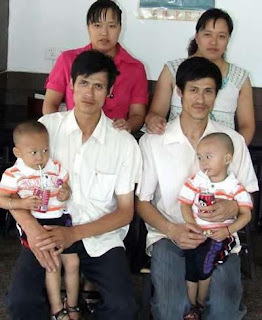 Restaurant manager also briefly look the same, but this is a couple of identical twins! The people around called "robot couple restaurant" because they see the same people who worked like a robot in running a restaurant than at 5 in the morning until 3 in the morning. So-called robot. 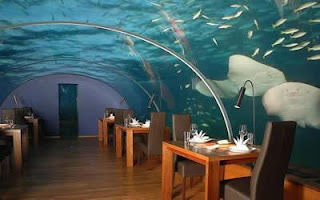 The first underwater restaurant introduced at the Hilton Maldives Resort & Spa, April 2007. Restaurant named Ithaa (read eet-ha) means Pearl in Maldives, Dhivehi, is 5 feet below the Indian Ocean, surrounded by coral and underwater panorama. This is the first restaurant to ketagori underwater. 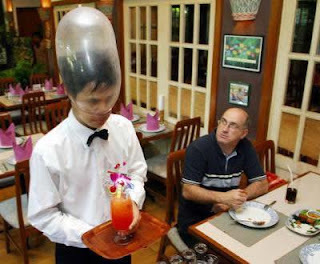 Cabbages dan Condoms adalah nama restaurant di Thailand. Ada banyak kondom di dinding2 dan lukisan kondom di karpet. Setelah makan, pengunjung akan diberi kondom di meja kasir. Keuntungan dari restaurant ini digunakan untuk mendukung yayasan Population and Community Development Association ( PDA ). D.S Music Restaurant di Taipei, Taiwan adalah restaurant dengan nuansa media. Dekorasi ruangan seperti rumah sakit, pelayanannya berpakaian seperti perawat, dan botol minumnya juga dikemas dalam botol infus. DS Music Restaurant in Taipei, Taiwan is a restaurant with the feel of the media. Decor of the room like a hospital, dressed as a nurse ministry, and also drink bottles packaged in an IV bottle.